Guard House (GH) Window | Defenshield, Inc. Bringing new visibility to traditional fortifications. The GH Window system is designed for installation in the walls of permanent or semi-permanent fortifications. 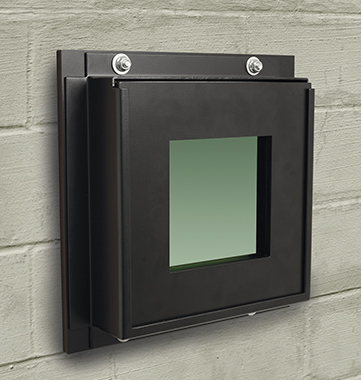 Particularly useful in concrete and steel guardhouses, bunkers and other entry control or patrol points that receive recurring enemy small arms and sniper fire, the GH Window allows for increased visibility without sacrificing safety, ensuring that your troops are always on the safe side. With durable, anti-corrosion powder-coated metal armor surrounding a 1-foot by 1-foot viewable area, the GH Window brings new visibility to typically opaque wall structures. More conventional window systems are also available for permanent buildings and guardhouses. Unlike the traditional GH Window, the framing of these windows is built directly into the construction, and the window itself offers an NIJ Level IV ballistic design for maximum protection. Should the glass of the GH Window’s viewing area sustain damage, soldiers can change the glass from inside the fortification in under two minutes without the use of tools. Personnel never need to leave the safety and security of the structure in order to make adjustments. The system provides up to NIJ Level IV Armor-Piercing Resistant protection and can be customized to fit varying sizes and applications.